in D by William Boyce, from the nineteenth century Stanford Magnificat and Nunc dimittis in B flat, from the twentieth century Francis Jackson’s anthem Sing praise to God who reigns above, and from the twenty-first century the Postlude – Fanfare : Processional by David Bednall. 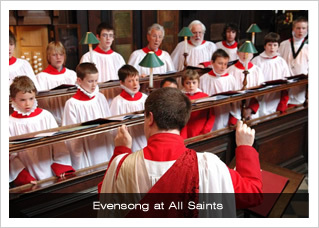 The language of the Book of Common Prayer is used at all our services, and Evensong according to the Book of Common Prayer is said or sung every day from Sunday to Friday. We are one of the few Churches in the County or the Diocese to continue in this way, and we include the State Prayers in full at each Evensong and, as Fr David reminded us in his Sermon 'whilst the 1662 Book of Common Prayer may not be regarded as the final word, especially with regard to its Eucharistic Liturgy, its language and principles have never been bettered'. 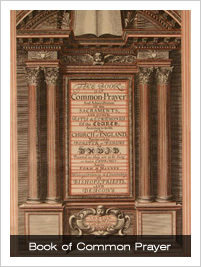 Our direct link with the Book of Common Prayer was highlighted in the service, which including the General Thanksgiving, composed for the Prayer Book by Edward Reynolds, Bishop of Norwich, and sometime Vicar of All Saints Northampton.